Resistance to different stress conditions constitutes regulation of many proteins among which Universal stress proteins (USPs) are the most important group of proteins found in plant cells. USPs are reported to be essential in different stress conditions and assigned as conserved domain, were subjected to database search. 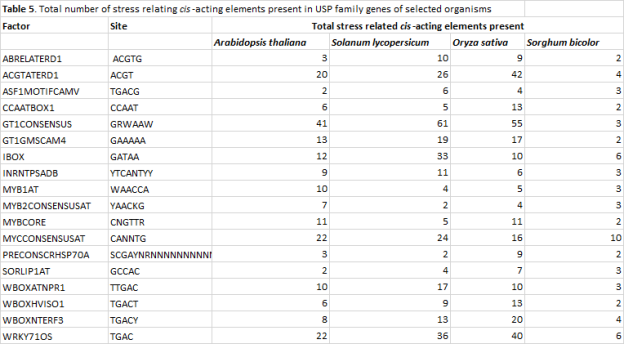 We found 35 homologs of USP in Arabidopsis thaliana, Cicer arietinum, Solanum lycopersicum, Oryza sativa and Sorghum bicolor genomes. A phylogenetic tree was constructed to establish their across species relationship. After that, test was conducted to decide whether positive selection is playing important role during evolution or the purifying selection. Our results shows the purifying selection playing important role in evolution. Functional divergence analysis showed that altered functional constraints may have taken place at some amino acid residues after their diversification. Gene conversion events are also analyzed to further study its role in evolution. The finding of important stress-related cis-acting elements in the promoter region of rice ATG6 genes demonstrated their involvement in abiotic stress responses. Collectively, these results suggest the involvement of USPs in different stresses, and provide a basis for further functional studies to investigate the biological mechanism of action of them under abiotic stresses. Universal stress proteins (USP) are widely spread proteins in nature. These proteins comprise of an important group of proteins found in numerous prokaryotes as well as eukaryotes. USP was first discovered in bacteria where its expression is enhanced when the cell is exposed to stress agents (Kvint, Nachin et al. 2003). The six USP genes of Escherichia coli have different functions linked to motility, adhesion, and oxidative stress resistance. Among these genes, UspA and UspD are required in the defence against superoxide-generating agents (Nachin, Nannmark et al. 2005). In plants USPs are induced by dehydration, salt stress, oxidative stress, and the phytohormone abscisic acid (ABA) (Loukehaich, Wang et al. 2012). They play an important role in enhancing survival rate during prolonged exposure to heat shock, nutrient starvation, or stressors from agents that arrest cell growth or damage DNA structures (Li, Wei et al. 2010). USP proteins have been isolated and characterized in plants. LeER6 of tomato was the first USP-related gene to be isolated and characterized (Zegzouti, Jones et al. 1999). The structural composition of plant USPs consist of USP domain and other functional domains (Kvint, Nachin et al. 2003). Sometimes many USP domains are present at the same time. The copies of the USP domains in the USP-containing organisms may vary from one copy, as is the case in the genome of some parasitic bacteria (Kvint, Nachin et al. 2003), to as many as 12 that were predicted to occur in the genome of Streptomyces coelicolor (O’Toole and Williams 2003). USP domains also occur in chimeras, where the USP domain is combined with unrelated sequences (Kvint, Nachin et al. 2003). USP homologues are ubiquitous in plants and encoded by gene families, while the functions of USPs remain largely unknown. The 44 putative USP genes in Arabidopsis are divided into two groups: ATP binding and non-ATP binding (Kerk, Bulgrien et al. 2003).Two Arabidopsis USP genes, At3g62550 and At3g53990 that encode an ATP-binding motif have recently been up-regulated in a drought microarray dataset. (Isokpehi et al., 2011). GUSP1and GUSP2 have been detected in water-stressed and salt-stressesd leaves of Gossypium arboretum and Gossypium hirsutum(Maqbool, Zahur et al. 2009, Merkouropoulos and Tsaftaris 2013). The phylogenetic analyses of USPs in different organisms (Arabidopsis thaliana, cicer arietinum. Solanum tuberosum, Oryza sativa and Sorghum bicolor) can serve as a model for understanding the diversification of duplicated genes under strong selective pressure. An effort was also made to identify the sites responsible for the functional divergence and to map them on the structural and functional regions of USPs. The basic local alignment search tool (BLAST) was used to query USP sequences from the genomes of Arabidopsis thaliana, Cicer arietinum, Solanum lycopersicum, Oryza sativa and Sorghum bicolor(http://blast.ncbi.nlm.nih.gov/Blast.cgi). As protein blast is more robust therefore it was used to search protein databases (Altschul, Madden et al. 1997). The option of sequence length to be covered was set to 50% and percent identity threshold was set to 50%. The resultant sequences were screened for genome annotation, as well as for Pfam and SMART created via hidden Markov model-based database searches, and processed for further study. Genomic and cDNA sequences of these proteins were retrieved from NCBI, and gene structure was predicted by FGENESH+ (http://linux1.softberry.com/ berry.phtml). The amino acid sequences of USP proteins were aligned using CLUSTALX (Jeanmougin, Thompson et al. 1998) with default settings and viewed by the Jalview 2 software (Waterhouse, Procter et al. 2009). Tree was constructed and summarized through MEGA5 by using maximum likelihood analysis (Tamura, Peterson et al. 2011). For the detection of the selective pressures operating on each coding site of USP proteins, three codon-based likelihood methods were run using CODEML package of PAML version 4.7 (Yang 2007): branch models (Yang 1998), site model (Rannala and Yang 2003, Kubatko, Carstens et al. 2009) and branch-site model (Yang and Nielsen 2002, Yuan, Bailey et al. 2005). In these analyses, maximum likelihood estimates of the selection pressure (ω) were measured by nucleotide substitution rate ratio (dN/dS) of non-synonymous (dN) to synonymous (dS). Estimation of amino acid site selection was done for all the USP sequences, and the parameter estimates (ω) and likelihood scores were calculated for three pairs of models to test evolutionary selection pressure: M0 (one-ratio) versus M3 (discrete), M1a (neutral) versus M2a (positive selection) and M7 (beta) versus M8 (beta ω). The three pairs of site models in PAML were chosen to test positive selection using likelihood ratio test (LRT) and the Bayes empirical Bayes (BEB) method (Nielsen and Yang 1998, Wong, Yang et al. 2004) was used to detect the positively selected amino acid sites. For detection of group –specific positive selection branch-site modelA was used in comparison with neutral model M1a. 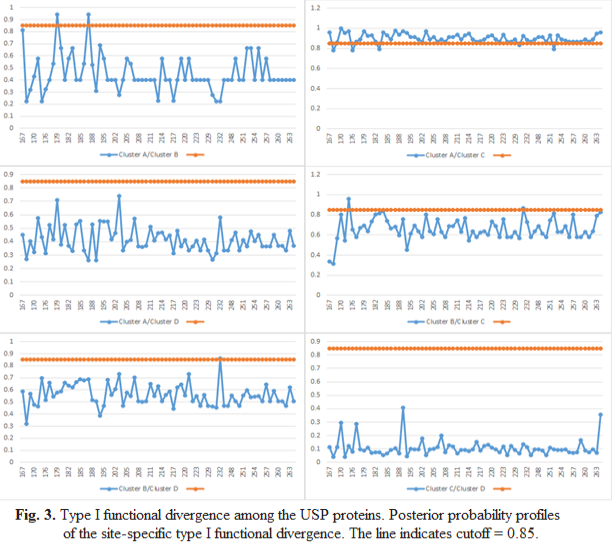 To estimate functional divergence between the groups of the USP protein family, type I functional divergence of the DIVERGE software (version 2.0) (Gu and Vander Velden 2002) was used. Aligned data of USP sequences was used for this test and construction of phylogenetic tree of the selected organisms was set to be default. The coefficient of functional divergence (θ), likelihood ratio test (LRT) and site- specific posterior analysis were estimated between the 2 groups. 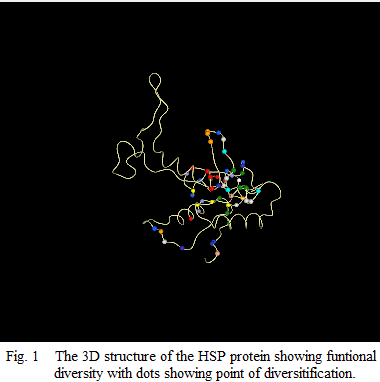 The 3D structure of the USP protein of O. sativa (NP_001055972.1) was obtained from the Swiss-Model (http://swissmodel.expasy.org/) (Schwede, Kopp et al. 2003) (Fig. 1). To detect possible gene conversion events the GeneConv softare package was used which is a well-established method for detecting partial gene conversion (Sawyer 1999). GeneConv not only finds but ranks the highest scoring fragments for the whole alignment in which partial gene conversion takes place by using globally and pairwise P-value. In this analysis, global and pairwise p-values were adopted and all polymorphic sites were tested for evidence of gene conversion using mismatch penalties (g-scale) of 1. At last, global and pairwise fragments were listed when the P-value ≤ 0.05. Plant specific cis-acting elements were analyzed in 1kb upstream region of Arabidopsis thaliana, Solanum lycopersicum, Oryza sativa and Sorghum bicolor. The cis-acting elements were predicted through the plant specific cis-acting elements database the PLACE (http://www.dna.affrc.go.jp/PLACE/). Initially, the available USP sequences were retrieved from the sequenced genome of selected organisms. Then, highly divergent, redundant and putative sequences were rejected and remaining 35 protein sequences were used in the present study. 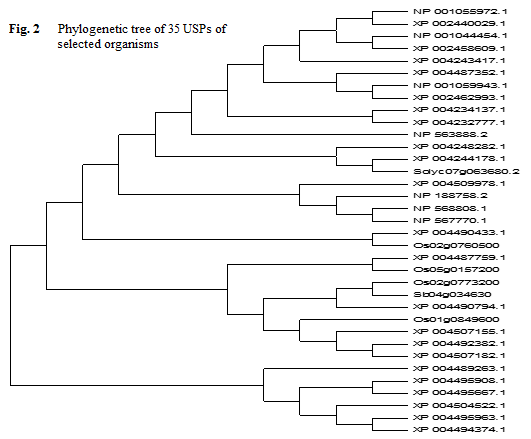 A phylogenetic tree with these selected USP sequences was constructed by using MEGA (version 2.0) (Fig. 2). Highly similar sequences within a subfamily suggested evolutionarily conserved similar functions also. The pattern of evolution of USP proteins was investigated by Codeml program of PAML, and significance was estimated through the LRT. The ω estimates for USP did not indicate positive selection instead, they indicate purifying selection during site-model. Different models were employed to investigate positive selection during site-model i.e. (M1a vs. M2a), (M0 vs. M3) and (M7 vs. M8) (Table 1). As few amino acids are supposed to be affected by positive selection at specific group on phylogeny, so highly conservative models estimating ω ratios were used. For this reason, branch-site model (Yang and Nielsen 2002, Yuan, Bailey et al. 2005) was implemented for the detection of positive selection of some specific sites of USP phylogeny. 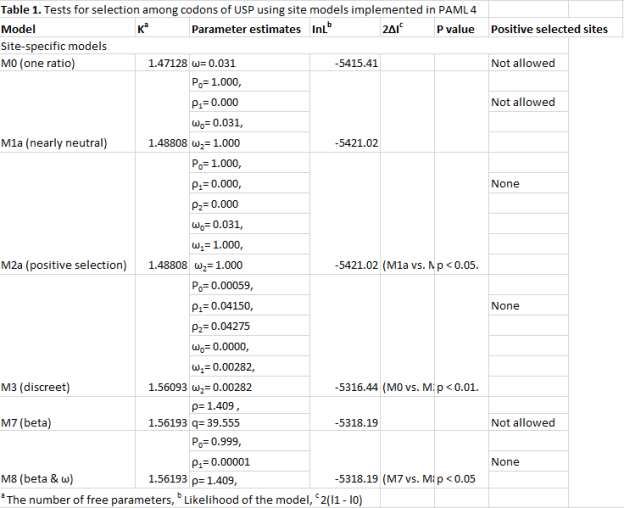 The LRT test indicates that branch-site model fits better than site-specific model (Table 2). In order to investigate adaptive functional diversification caused by amino acid substitutions in the USP sequences, functional divergence analysis of DIVERGE program was performed (Gu and Vander Velden 2002). Pairwise comparisons of proteins groups (cluster A, cluster B, cluster C and cluster D) were carried out and the rate of amino acid evolution at each sequence position was estimated. These analyses were used for the identification of important amino acid residues which are potentially responsible for functional divergence. Six coefficients of functional divergence θ with standard errors and significance levels are given in Table 3. The results indicated statistically significant site-specific shift of evolutionary rates suggesting that altered functional constraints may have taken place at some amino acid residues after their diversification. In combination with suitable cut-off values derived from the posterior probability of each comparison, the amino acid residues responsible for the functional divergence after gene duplication were predicted based on site-specific profiles (Fig. 3). A cut-off value Q(k) ≥ 0.85 was used. Gene conversion is the process of copying one segment of DNA to another segment of DNA (Sawyer 1999). Short-segment gene conversion is acknowledged universally as an important force in evolution. For better understanding of the possible gene conversion events that have occurred during the evolution of USP proteins, GeneConv software was used to detect such events. The results showed that all gene data sets did not have significant signal for global outer-sequence fragments. 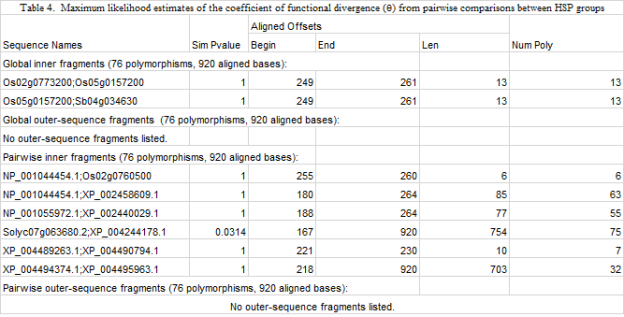 Total of 8 pairwise inner significant fragments and only 2 global inner significant fragments could be found (Table 4). It is supposed that tandem duplication occurs firstly in USP and then few of them may have migrated to other parts of the genome. Based on these results, it can be safely concluded that gene conversion events must have occurred at the USP locations constantly and thus led to their evolution. USPs are triggered by different stress conditions. It would be interesting to investigate presence of stress related cis-acting elements with regards to plants. Analysis of 1kb upstream regions of Arabidopsis thaliana, Solanum lycopersicum, Oryza sativa and Sorghum bicolor revealed stress related cis-acting elements including ABRELATERD1, ACGTATERD1, ASF1MOTIFCAMV, CCAATBOX1, CURECORECR, GT1CONSENSUS, GT1GMSCAM4, IBOX, INRNTPSADB, MYB1AT, MYB2CONSENSUSAT, MYBCORE, MYCCONSENSUSAT, PRECONSCRHSP70A, SORLIP1AT, WBOXATNPR1, WBOXHVISO1, WBOXNTERF3, WRKY71OS in the promoter region of USP family genes (Table 5). Universal stress proteins are the widely available protein in nature. These proteins are triggered during stress conditions. The large amount of genomic and cDNA sequences available for Arabidopsis thaliana, Cicer arietinum, Solanum lycopersicum, Oryza sativa and Sorghum bicolor provides new insight for exploring functional diversity prospective of phylogenetic. Many variants of USP are discovered in plants (Maqbool, Zahur et al. 2009, Merkouropoulos and Tsaftaris 2013)and the research is still going on. Phylogenetic analysis of 35 USPs suggests their important role during plant growth yet their precise regulatory functions are largely unknown till date. Our results clearly showed that phylogenetically all USPs have conserved similar function. For the detection of positive selection along pre-specified group, three models i.e. branch-specific model, site-specific model and branch-site model were used separately. The results of branch models showed that the ω ratios vary among clades and the results of the site models indicated that one category of ω didn’t fit data well to describe the variability in selection pressure across amino acid sites, so the branch-site models that allowed the ω ratios vary among sites and lineages simultaneously could be the best model for the USP protein family. To confirm whether the foreground branches were under positive selection, we conducted test 1, which shows the significant result showing positive selection. Another evolutionary force which leads to differentiation is gene conversion event. Gene conversion acts to homogenize the DNA sequences of a species in gene pool (SYWULA 1989, Chen, Cooper et al. 2007). In the present study, 8 pairwise inner fragments were identified clearly indicating that gene conversion events may have played significant role during molecular evolution. Cis-acting elements were analyzed in the promoter regions of USP family genes for further exploring their stress responsiveness (Rana, Dong et al. 2012). We found multiple cis-acting elements related to different stresses, among which ABRELATERD1, ACGTATERD1, ASF1MOTIFCAMV, CCAATBOX1, CURECORECR, GT1CONSENSUS, GT1GMSCAM4, IBOX, INRNTPSADB, MYB1AT, MYB2CONSENSUSAT, MYBCORE, MYCCONSENSUSAT, PRECONSCRHSP70A, SORLIP1AT, WBOXATNPR1, WBOXHVISO1, WBOXNTERF3, WRKY71OS are important cis-acting elements for the USP,which are involved in the regulation of stress-responsive genes (Meng, Zhao et al. 2006, Mochida, Kawaura et al. 2006, Rana, Dong et al. 2012). The presence of these elements suggested that the expression of USP may be stress induced. In conclusion, genomic data have provided us an opportunity to have an insight of the molecular evolution events that led to formation of USP family from a phylogenetic perspective. The result of statistical analyses indicated that purifying selection appeared to be the main force on the evolution of this family. The detection of functional divergence among the USP groups also confirmed that the USP members had acquired different functional properties owing to rate shifts of a small set of amino acids after gene duplication events. Our study was an effort to better understand the precise role of natural selection to create functional diversity in this family.